An I.B.M. Card Program Computer has been programmed to compute thin lens aplanatic doublets. Thirty-eight solutions are included in a table. One solution is completely ray traced after proper thicknesses are added to show the value of a thin lens solution. Thin lens aplanatic doublets of focal length 10. 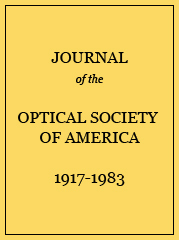 Lens specification, third-order aberrations, and ray trace data for trial design evolved from case 19 of Table I.
a D. P. Feder, J. Opt. Soc. Am. 41, 630 (1951). Lens specification, third-order aberrations, and ray trace data for design of Table II modified by differential bending method. Approximate C.P.C. time required to arrive at design given in Table III starting from the choice of glasses.